I LOVED IT. (In fact, as carbonated beverages go, in my book it’s almost right up there with Moxie !) The ingredients are seltzer, cherry, and lime, so figuring out how to make this at home shouldn’t be difficult, right? Well, it’s not quite that easy. Googling around has led me to tons of recipes that vary in lots of little ways. For example, some call for cherry syrup, others say to use cherry juice, and others recommend grenadine (which is weird, because technically that’s supposed to be pomegranate flavor). And don’t even get me started on the great debate between lime juice and lime syrup. So before I go shopping for ingredients and start experimenting, I figured I’d see if anyone out there has a great recipe for a cherry lime rickey. 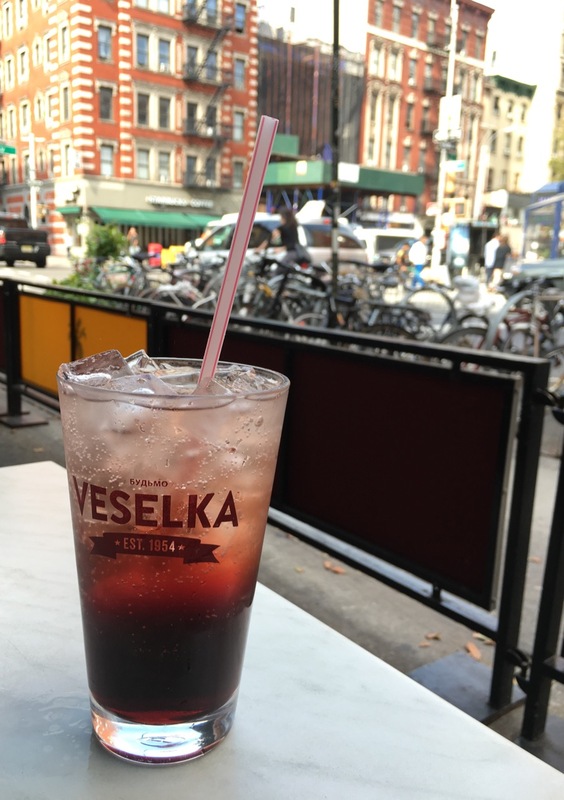 (Bonus points if your version tastes exactly like the one at Veselka!) Anyone? Wishing: For a sundial like this one to put in my yard. Laughing: About this video on YouTube, which features one joke from every MST3K episode. My recent discovery of this is well-timed: just a few weeks ago I met Joel at an MST3K event and got to shake his hand. Reflecting: On the hidden costs of chocolate. 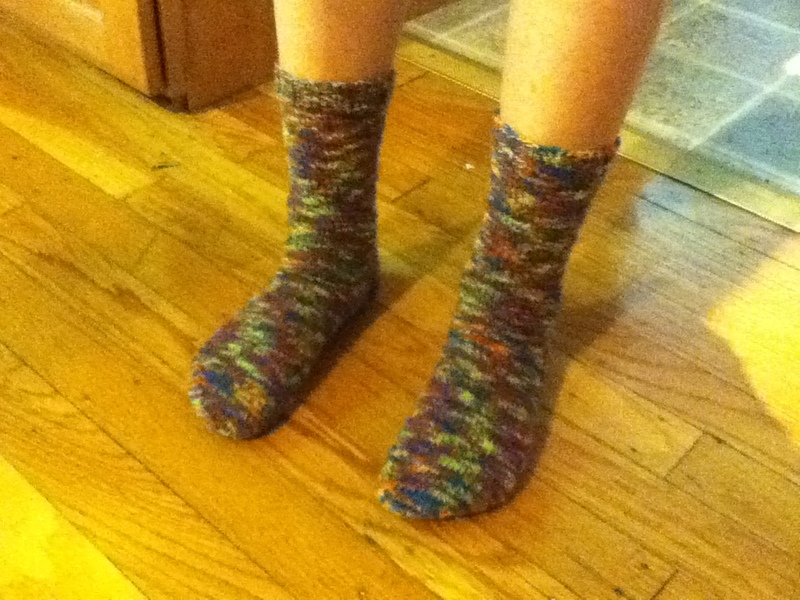 Being delighted: By the fact that not only was my daughter thrilled with the new socks I just finished knitting for her, but she was so pleased that she wore them right away. Even though it was 95 degrees outside. Now that’s gratifying! Watching: Or trying to watch, at least, My Dinner with Andre. It’s famous and there are a gazillion cultural references to it, so I figured I ought to (finally!) watch the thing. I got about forty-five minutes into it and had to turn it off. I recognize that it was innovative for its time, and the premise could still make for a good movie today. But the conversation itself was so mind-numbingly dull that I just couldn’t bear it. Reading: Nation, by Terry Pratchett. It took me a little while to get into this book–most likely because my subconscious kept expecting Discworld fare–but once that happened I was hooked. The premise is somewhat grim, and the overall tone is decidedly lacking in the humor of his other works. But his usual themes are present: questions about religion and rationality, criticisms of social class, clever wordsmithery. I hate the ending, though. Long before it arrived its inevitability was apparent, and I found myself reading the last chapters while hoping Pratchett would enable the protagonists find a way to escape the destinies that seem to be laid out before them. No such luck, I’m afraid. The ending is bittersweet and leaves me feeling punched in the gut…but honestly, I can’t imagine how else the book could have ended without ruining it. So for all that I do hate the ending, at the same time I think it’s appropriate. Watching: A corgi in a swing. Yes, that’s what I said. Being impressed by: These recipe redesigns. The use of illustrations as instructions is a recipe is nothing new (for example, Molly Katzen does it in her awesome cookbooks for preschoolers, Pretend Soup and Other Real Recipes ” and Salad People and More Real Recipes ), but the designs here are especially nice. Wishing: I had an extra $300 lying around. I think this project is awesome, and I really love the design of this chair. Getting back from: The Netherlands. We were there for nearly two weeks and returned a few days ago. Once the jet lag fully wears off and I get my act together, details and photos will be forthcoming. Mark Bittman has been prodding us to think about where our food comes from—and the animals involved in that supply chain—for some time. In his latest essay in The New York Times, he looks at how animals are treated throughout our society—and how context speaks volumes. 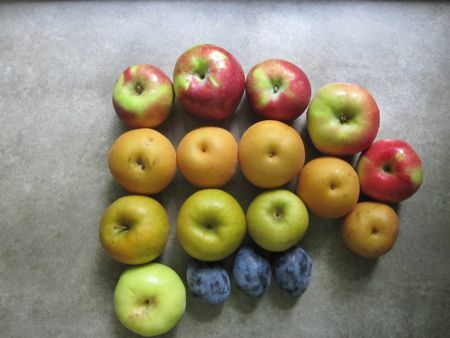 Photos of everything one man ate during 2010. Everything. It’s an overview of one person’s diet. Judging by the the appearance of the tag cloud (with things like “chocolate” and “tortilla chips” feature prominently), it doesn’t look particularly extraordinary. But seeing everything laid out, especially in the monthly views—that is pretty amazing. I’ve been stockpiling a bunch of links I think are interesting but am having trouble finding the time to give each link the proper writeup it deserves. So I’m just going to dump them into one post and let you wade through them as you like. Enjoy! Get your SQUEE on: the Battlestar Galactica series bible (PDF).If you liked the recent BSG series even one little bit, you will like this document. Mark Bittman recently announced that his column “The Minimalist” was leading the New York Times cooking section after thirteen years. He promises bring his recipes and commentaries to other pages of the NYT (including his blog), so he’s not leaving us for good. If you’re one of his fans, take a look at this page, which functions as a quasi-index/TOC of all of his columns. I have several friends who run marathons regularly. I admire them for their discipline and dedication. At the same time I think they are slightly nuts. I like the idea of a marathon but feel a bit muddle-headed when I start envisioning all the training that goes into preparing for one. Which is why I found this post intriguing: How to Hack a Marathon If You Aren’t a Runner. So what do you think, those of you who run a lot—would it work for you? “Are Disney Princesses Evil?” The short version of my response to this is “yes.” But it’s not just Disney—it’s the onslaught of branding that children are exposed to from infancy. This branding seeks to limit their choices and to turn them into consumers, and I think both of those aims are Not Good Things. Any of you who have ever owned cats or spent a lot of time with them can surely relate to this:[youtube]http://www.youtube.com/watch?v=2XID_W4neJo&feature=player_embeddedSurprised%20kitty:%20http://www.youtube.com/watch?v=0Bmhjf0rKe8[/youtube]Here’s an anti-unicorn-chaser to follow all that feline cuteness: the Zombie Tabernacle Choir. Those China Pearl Peaches taste like summer flowers. I am not kidding. 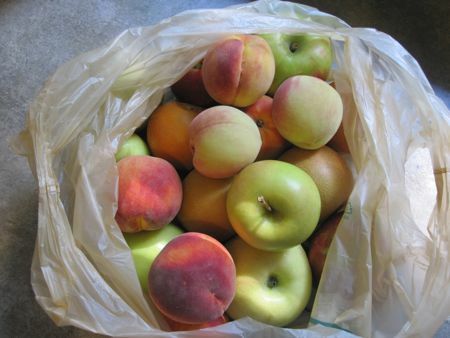 They are the Best Peaches I Have Ever Eaten. 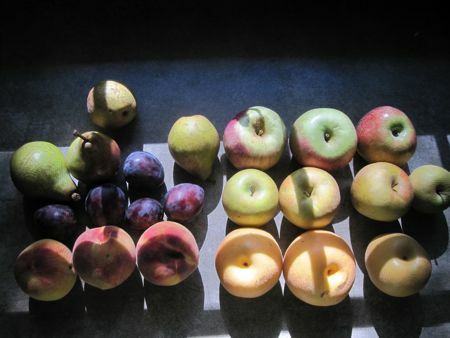 Those Hosui Asian Pears are so juicy that I may have to follow the CSA owner’s advice and wear a bib when eating them.